Don't forget your Lasso of Truth, your indestructible bracelets – or anything else! 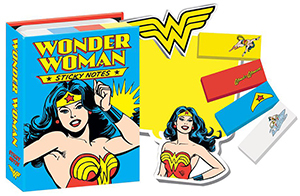 This booklet has hundreds of Wonder Woman notes to make all your reminders 100% more heroic. They're the #1 sticky notes of warrior princesses! The books measure 3 1/4" X 4 1/4" and will fit nicely in your purse, bag or back pocket!